Not to much happened this week of note except Bailey had a couple play dates with some boys from her class. She went to Maxim's house and went to the Plittersdorf Fuβball club with him to play soccer. She loved it. Then, on Saturday she had a play date with Joe who brought her a flower in a really cute pot and he wanted to cook her dinner so she stayed until the evening. Both boys have been very nice to her and have made the transition to the new school, town, Country a little easier to handle. Avery had her first Ballet class, which by a misunderstanding between the teacher and myself, landed us there on the wrong day. She let her dance anyway with the 5-year olds. I could tell Avery was a little nervous but she handled it okay and soon was dancing and skipping with all of the other girls. I was very proud of her that she decided to take dance at a studio where it is taught in Deutsch. The teacher also speaks English and French, but does the primary instruction in German. I had to conduct my second week of Relief Society in German. It went okay. I asked someone else to make the announcements. Just when you thought life was going to go back to normal...some out of the ordinary things happened this week. I started taking all of the Christmas stuff down, including the 3 meter tree which I had to cut in half with a saw to get it outside and then cut all of the branches off of the lower portion of the trunk to get it outside. But, Bryn and I did it. She helped by holding the door open for me so I wouldn't get locked out. Then, on Wednesday morning, Bryn thought she would surprise us by hiding my car and house keys in the dress-up clothes drawer so we had to search and search for about a half an hour which made us a bit late to school. On Thursday morning, while we were putting everyone in the car to go to school, we got hit by a bus. Yes, a big Bonn City Bus. We were in Greg's Fiesta, and if you can believe it, the bus had more damage than the car. We had just a large scratch on the inside of the open door, of which I was standing in buckling Bryn into her carseat when it hit us. I was a few inches from getting hit myself. I thought when it hit that he had taken the whole door off so I was a bit afraid to look, but thank you to the expert craftmanship of Ford products, we got a scratch and the bus lost a whole rear bumper and tail light. I called the school and told them we were going to be a little late because we got hit by a bus. I think I'm starting to lose credibility with all of these bizarre reasons we are late. To any Ford Advertising people who read this blog, you should make this into a commercial. A Ford Fiesta taking on a City Bus - A friend of mine called it a regular David and Goliath story. We finally received the last Christmas package we were waiting for from France. And, we also received a very cool package from Greg's brother and family. Thanks. It is so awesome. In fact, I am eating a frozen Reeces peanut butter cup as I am writing this and it is a taste that I had forgotten how much I love. You can send us packages like that anytime, although I am sorry about the cost of shipping. To all the Detroit people out there, I heard there are amazing fares to Europe right now (until March) from Detroit. I have no idea the particulars or if the deal will still be going on by the time I post this, but it is probably worth a try if you are looking to visit. Just don't come the first week of February as we are expecting Greg's parents for a visit. This will be the first time Papa has been able to come over and see us since we moved in May. The weekend was great. We spent Saturday sleeping in, shopping, and getting ready for our dinner guests. Some friends of ours from Ann Arbor (but we actually didn't know them until we all came here), and some friends that I met through Bryn's toddler group. They are the ones who hook us up with some things from the American Army Base. We had Bunjacowda, Raclette, and Chocolate Fondue. I know we have been doing the Raclette thing way too much lately but it is so good. We had a great time and the kids all played very well together. Sunday, I had to conduct Relief Society in Deutsch and lead the music. I had a cheat sheet in case I forgot what I was supposed to say which came in pretty handy. I was very nervous but now that I have done it once, I think I will be more relaxed next week. We had our first lesson on Joseph Smith today and the Sister teaching had a copy of Joseph's handwritten First Vision. I thought that was pretty cool so I did some searching on the Church website and found this link, which has a ton of historical Church documents. I thought it was very cool. Take a look if you have not seen it before. New Years Day we hung around the house. The only thing of note to mention, especially to the Florida fans out there, is that University of Michigan took them to town in one of the best bowl games ever. Being that it was Lloyd Carr's last game in coaching the team, the players carried him off the field. I think the only other time I'm quite that emotional is when I'm watching, "Rudy." I threw that bit of comedy in there for Brent Kearney's sake. Needless to say, it is a good thing our internet was fixed and Greg did not miss the game. We took off for Brussels the next morning. I was really pleasantly surprised by the city. 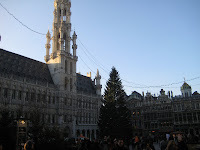 The picture to the left is of the Grand Place (town square). I had been there before but didn't remember how cool it really was. We tried to get to the Waterloo museum before it closed but we were unable to make it. 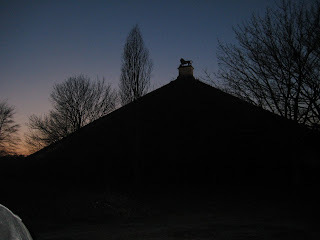 We still got to see the monument on the hill overlooking the battlefield, however. We had the best waffles I have ever had at the Carrefour grocery store there. We stayed one night at a hotel outside of Waterloo (Greg caught us dancing in the hotel room) and started out the next morning bright and early for Paris. 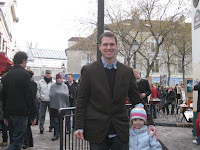 This trip was a must as my nephew said the only thing he really wanted to see in Europe was the Eiffel Tower. 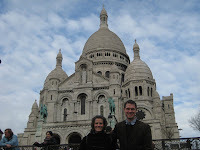 We arrived in Paris in late afternoon, after checking into the hotel, buying our train tickets, and taking the train about 30 minutes into the city. 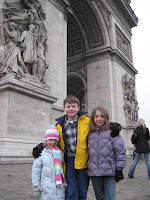 We went first to L'Arc de Triomphe where most of us made the trek to the top. Caryn, Bryn, and I stayed behind. Bryn had a better time running around the tunnel. After a car ride and then a train ride, she was ready to run. 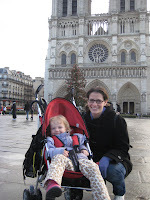 We then went to La Tour Eiffel (which is what Evan had been waiting for). The line was pretty long and we decided to have dinner and climb to the top the next day. On the way back to the train station, we got to see the Tower lit up. It was really something to see. The times before when Greg and I had been to France, we had never seen the Eiffel Tower at night. The next morning we split up for a bit. Unfortunately, my sister and her family misplaced their three-day train tickets and had to buy new tickets for the second and third day. That is always a bummer. 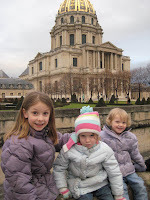 While they went to the Eiffel Tower, we thought we would take the girls to Sacre Coeur and Montmartre. Bailey is all into being an artist, we thought it might be cool for her to see artists in action. Both Bailey and Avery found a small original piece they liked very much. 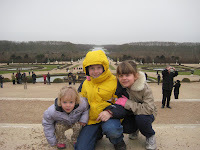 We went to L'Orangerie to see Monet's "Nympheas." It is one of my favorite museums in all of Paris - small but poignant. 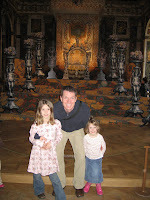 We walked through the Tuleries to the Louvre (grabbing a chocolate crêpe on the way) but just to see the outside. 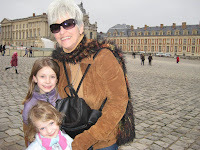 We met my family at the Hotel des Invalides where we let the kids run and play for a bit. We had dinner close to the hotel that evening. Our last day in Paris we went to Notre Dame on the way to Versailles. Notre dame is just so beautiful. It doesn't matter how many times you see it, there is just something about it that is breathtaking. All along the trip my sister kept waiting for a castle that was ornate. We delivered. Versailles was by far her favorite part. We spent a good part of the day there. On the way back to the train station, we stopped into McDonalds to grab a bite to eat on the train on the way back. We actually missed the first train because my sister's family took forever to get several milkshakes. It reminded us of our Salt River Canyon trip together for a brief moment. We drove back to Germany that night and returned quite late after several mishaps with exits being under construction and Greg passing a couple of bathrooms. It was still nice to get home and sleep in our own beds. My family's last day in Germany was very mellow. The kids played. Greg, my mom, and Matt went for a walk around Bad Godesberg. Caryn and I read and talked. 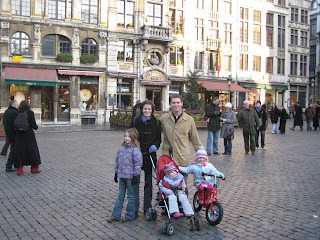 We took them to a hotel that night so they would be closer to the airport. All in all, I think we had a good time together and hopefully they got to see a few things that they otherwise wouldn't have seen.